Criminal fantasy dream-site Webstresser[. 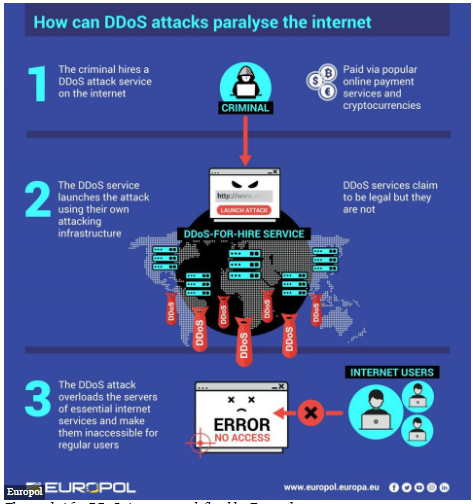 ]org, a DDoS-for-hire market believed to be behind at least 4 million cyberattacks around the world, has served up its last internet-paralyzing traffic tsunami. A multi-national investigation led by Europol has led to the arrest of the administrators of the site, which sold the capability to knock websites offline and take down domains for as little as $18 per month. The appropriately named Operation Power Off, led by the Dutch National High Tech Crime Unit and the UK’s National Crime Agency, with the support of Europol, the FBI and a dozen law enforcement agencies from around the world, also shut down the service completely and seized its infrastructure, which was installed in the Netherlands, the US and Germany. The administrators were located in the Canada, Croatia, Serbia and the United Kingdom, and further measures were taken against the top users of marketplace in Australia, Canada, Croatia, Hong Kong, Italy, the Netherlands, Spain and the United Kingdom, according to Europol. Webstresser, which Europol bills as the world’s biggest DDoS-for-hire marketplace, had more than 136,000 registered users, who carried out a combined 4 million attacks as of April 2018. The rise of cheap DDoS-as-a-service has lowered the barrier to entry for would-be cybercriminals and hacktivists to get into the website-blocking game, so the demise of Webstresser is sure to send a few shock tremors across the underworld landscape. Unsurprisingly, the frequency of attacks has increased. Bromium CEO Gregory Webb told Threatpost that there are on average 6.5 million DDoS attacks per year, each reaping significant financial gain for the bad actors behind them: DDoS attacks-for-hire generate $13 million in revenue per year, he said. Meanwhile, the average DDoS attack costs a business around $200 per day, with some rising to as much as $1,000 per day. And that’s why there are likely to be other sites rising to take Webstresser’s place. They’re difficult to disrupt, since many of these bill themselves as “testing” services, for legitimately gauging a website’s resiliency to, you guessed it, DDoS attacks.